The Lions slip to the bottom of the Championship after losing 3-2 at home to Birmingham City. Birmingham now move eight points clear of the drop leaving Millwall at the foot of the table as Charlton, Yeovil and Barnsley all pick up results in what was a must win game for Holloway’s men. The goals came from Liverpool loanee Jordan Ibe, Andy Spinnie and Nikola Zigic cancelling out a Steve Morison and Simeon Jackson penalty for the home side. Steve Morison had the first clear opportunity for the home side as Randolf made a great double save from the striker’s original shot and followed up with a second but Randolf was equal to it. Birmingham took the lead 18 minutes in against the run of play as the ball was not cleared by the Millwall defence and fell to Jordan Ibe who fired his shot low in to the bottom right corner. Millwall responded well on the half hour mark as Morison again got beyond the defence and smashed his shot goal-wards which hit Paul Robinson to equalise. 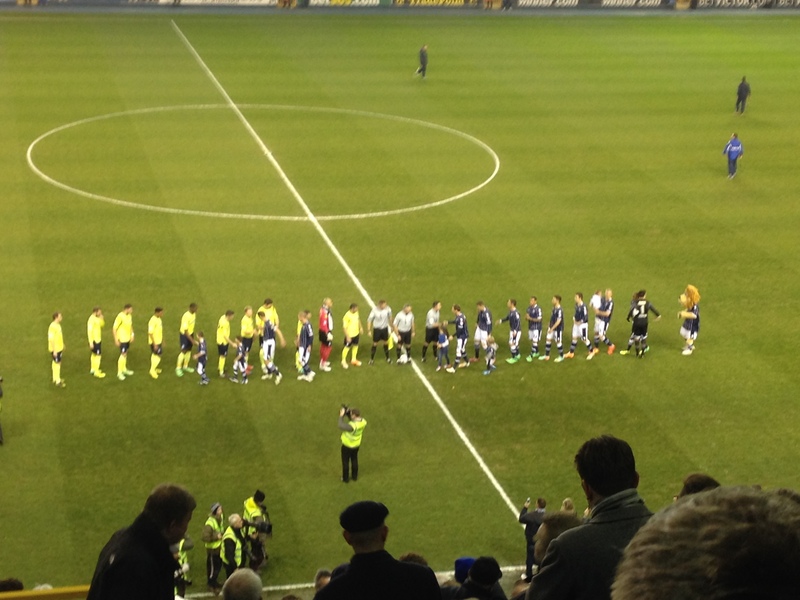 The game stayed level for only five minutes as Birmingham regained the lead from Tyler Blackett’s cross which was headed in from close range by Andy Shinnie. Early in to the second half a strong claim for a penalty was dismissed for the home side as DJ Campbell got in behind the defence and went to lift the ball into the box but hit what looked to be a blatant high arm from Robinson but nothing given. The match went from bad to worse for the Lions despite Holloway’s double change at half-time as seven minutes in Chris Burke beat his man and chipped the ball in to the box for Nikola Zigic to head in to the far post to put Birmingham 3-1 in front. Millwall had a glorious chance to get back in the game 12 minutes from time as Scott Mcdonald played in SImeon Jackson, his shot was saved and substitute Stefan Maierhofer crossed the ball back in for the box for Owen Garvan to head wide of a gapping goal. The home side were awarded a penalty two minutes from time as Jackson was brought down and he coolly converted from the spot to make it a frantic last few minutes. Millwall Line-up: Forde, Dunne (Jackson 45), Robinson, Lowry (Beevers 45), Fredricks, Abdou, Garvan, Woolford, DJ Campbell (Maierhofer 60), Mcdonald, Morison. This entry was posted in Football, Sport and tagged Birmingham, Championship, Ian Holloway, Lee Clark, Millwall, Nikola Zigic, Steve Morison. 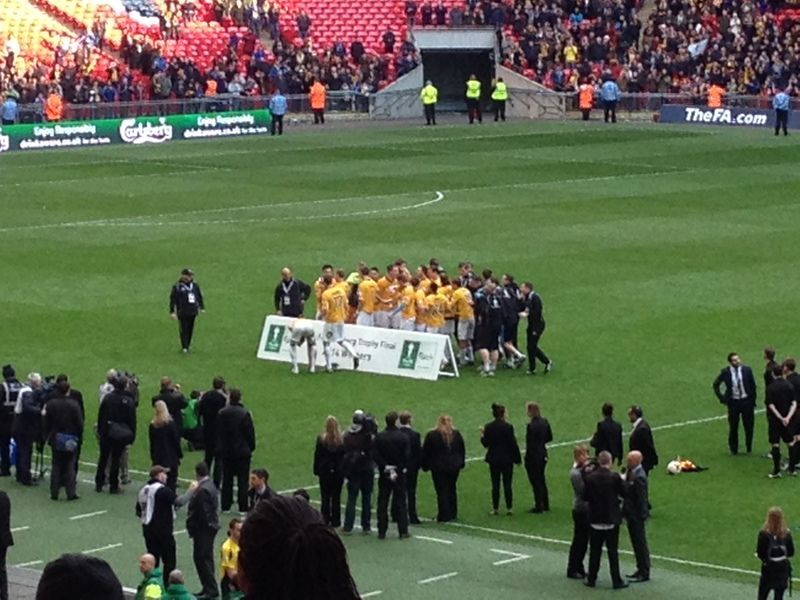 Cambridge United take the FA Trophy after a convincing 4-0 win against Gosport Borough at Wembley. Josh Gillies grabbed the opener followed by a brace for Ryan Donaldson and finished with a penalty for Luke Berry. Gosport started strong and looked the better side for the first 35 minutes with Nathan Ashmore keeping out shots from Ryan Bird and Josh Gillies. Cambridge broke the deadlock seven minutes before half time as Josh Gilles lifted the ball over the defence for Ryan Bird to guide the ball over Ashmore who could not do anything about it. Cambridge took their chance when it came and lead at the break despite Gosport being the better side overall and knocked the steam out of Gosport for the final seven minutes of the half. In the second half Cambridge doubled their lead early on in the 50th minute Ryan Donaldson took down a great long pass by Ryan Bird and went round the keeper and slotted the ball in to double their lead. On the hour mark Ryan Donaldson grabbed his second as Josh Gillies shot came off the post then pin balled around the box until it fell to Donaldson who struck it in to the bottom left hand corner. Gosport had a claim for a penalty to give themselves a chance for a comeback but referee waved away appeals from the Gosport players. Cambridge put the icing on the cake twelve minutes from time from the spot this time after Sam Pearce brought down Andy Pugh and Luke Berry stepped up and sent the keeper the wrong way. Gosport almost got a consolation four minutes before the end as Dan Woodward hit the bar as Cambridge claimed their first ever FA Trophy. This entry was posted in Football, Sport and tagged Cambridge United, FA, FA Trophy, FA Trophy Final, Gosport, Gosport Borough, Josh Gillies, Ryan Donaldson. Thurrock clinch a second half goal to take all three points and continue their push for automatic promotion at ship lane. A 75th minute header by Thurrock’s top goal scorer Dave Knight was enough to see off Cheshunt. Before the game a pre match presentation was given to Thurrock for performance of the month for February including their 10-1 drubbing against Erith and Belvidere. A slow start for both teams in the first half but the first chance came 11 minutes in as Luke Marshall for Cheshunt almost got on the end of a sloppy back pass from Thurrock but Andy Walker was equal to it. Two early substitutes had to be made one by each side due to injuries for Thurrock Robert Clark was replaced by Jordan Clark and for Cheshunt Luke Marshall was replaced by Robbie Nash. Thurrock top goal scorer Dave Knight nearly got on the end of a poor Cheshunt back pass and touch by the visiters keeper but just cleared it before Knight pounced. The away side had the first guilt edged chance five minutes before the break as Josh Cooper was played in but Walker saved it down low to his right and out for a corner. The second half improved with Thurrock beginning to pressure Cheshunt as a Remi Sutton free-kick was flicked on which came to Lewis Clark who miss timed his volley wide. Thurrock increased the intensity as a long throw came to Ryan Fleming to turn his man and hit a thunderous volley from eight yards out but was somehow tipped over the bar by Wil Viner. The home side broke the deadlock from the resulting corner after a great cross by Mark Onyemah for Dave Knight to bullet his header in from close range. Thurrock held on and secured their three point but stay fourth by goal difference but still with two games in hand. This entry was posted in Football, Sport and tagged Cheshunt, David Knight, Jordan Clark, Mark Stimson, Thurrock. Who is going to win the ICC final? This entry was posted in Short Mat Bowls, Sport and tagged Cheshire, Hampshire, short mat bowls. The University of East London 2nds get a revenge victory over University of Essex as they won 2-0 at Memorial Park. The title race will now go down to the wire and be decided in the next couple of weeks as UEL continue to put pressure on their league rivals Queens Mary’s University. UEL were looking to turn around their first encounter with Essex after losing 5-1 away from home. The home side got off to a good start taking control of possession and testing the opposition and were looking to break down the defence early on. UEL broke the deadlock ten minutes in after a great surging run by Stefan Neilson, squared a pass to Jason Ngandu to slot his shot into the bottom corner to give UEL a deserved lead. Minutes later UEL nearly doubled their lead after great link up play from Ngandu and Neilson with his shot on the edge of the box saved at full stretch by the Essex keeper. Malachi Benjamin was the next to threaten the Essex goal with great work down left flank took on the defender and drilled a shot just wide. The visitors got their first chance of the game as the Essex midfielder dinked a ball over the defence for the big powerhouse striker to run on to. Dan Robinson came off his line but the striker lifted the ball over Robinson, but wen narrowly wide. As the half hour mark approached UEL’s link up play from midfielders through to the strikers was sublime and just missed the end product as William Semain’s shot was always climbing. With nine minutes remaining of the half a Benjamin corner fell to Dylan Feehily to get a free shot off but scuffed his initial shot and was cleared. At the break all UEL were just missing a second goal to take control of the game, going into the second half UEL made an early substitution as Benjamin was taken off due to a slight injury for Henry Hayden. UEL had an early scare as the ball was intercepted by a stray pass on the half way line and broke the home sides defence. Feehily pressured the Essex striker who only managed a tame shot which was smothered by Robinson. On the hour mark UEL kicked on again and Neilson ball over the defence went into the path of Ngandu who was in on goal and his low shot was well saved to deny the hosts a second. The warning signs were still there for UEL being only a goal up, after a first time cross was chested down and first time strike from the visitors was comfortable for Robinson. The away side almost equalised as a corner from the far left hand side went to the far post but was headed downwards and bounced just over the bar. UEL finally got their killer goal with 13 minutes remaining after William Semain turned defence into attack with a great cross field ball to Neilson, who let the ball bounce then hit a volley in to the bottom corner, leaving the keeper bewildered. The home side nearly extended their lead as a corner was met by Harry Matthews but came back off the post, which would have put the icing on the cake for UEL. Neilson almost grabbed a second from Substitute John Silva’s retrieved cross with a fierce shot excellently saved from close range. UEL could not increase their lead but a well-deserved three points to keep them in contention at the top. A great team performance from all the team and will have to count on a Queen Mary’s to slip up if they are to take the league title. UEL finished with a 100% home league record and will travel to University College of London for their final game on the 19th of March. Line-up: Robinson, Wright, Feehily, Harold-Egole, Hammond, Benjamin (Hayden 45), Matthews, Semain, Lelis (Silva 51), Ngandu, Neilson. This entry was posted in Football, Sport and tagged Essex of University, UEL. UEL’s footballers came out on the wrong side of a six-goal thriller with Queen Mary’s University. The second string lost the top of the table clash 4-2 and are now one point behind their rivals with two games left. Queen Mary’s hit the ground running and took an early lead in the second minute as a one-two between their QM strikers on halfway sent Gemill racing clear to give goalie Sam Pashley no chance. They went close to a second when another break saw a shot fired straight at Pashley, but UEL rallied and Marley Spindel’s run and cross found Harry Tew-Robinson, whose overhead kick went just wide. Queens hit a post before UEL’s Johan Caney-Brown burst into the box and crossed for Maliki, who shot was held just before half time. And Richard Johnson’s curling effort was spilled after the restart, before the keeper recovered to smother the loose ball. UEL were rewarded for their hard work on the hour when Spindel’s ball over the top sent Tew-Robinson into the box, where he was fouled by the keeper. Johnson converted the penalty to level but UEL were behind again nine minutes later when Pashley’s clearance fell to a Queens striker, who tucked his shot home. UEL were back on terms almost immediately as Johnson curled a free kick into the bottom corner to make it 2-2 with less than 15 minutes to play. And their hopes were further raised when Queens were forced to replace their injured keeper with an outfield player for the closing stages. But UEL were caught out five minutes from time when a defence-splitting pass left Brandon Manoka in a race with the Queens winger, who slid his shot home. The same player broke again on the right soon after and when his cross was spilled by Pashley, under pressure from a Queens striker, the ball was smashed home. UEL could not find a way back during seven minutes of injury time and slipped to second, ahead of their final home match of the season against Essex University thirds, and hoping Queen Mary’s slip up if they are to win the league. This entry was posted in Football, Sport and tagged Queen Mary's, UEL. Aveley miss out on three points to halt their promotion push as they lost 3-0 with two early goals from Kris Newby and Danny Emmanuel. The third goal was a controversial penalty given and converted by James Stevens minutes from the end to deny any chance of a comeback by ‘The Millers’. Witham Town now move up to fifth with games in hand and are in contention to climb higher and pull further away from Aveley who stay where they are in 11th. The away side hit the ground running and got the opening goal within the second minute after a corner from the right was cleared off the line, only to in-form striker Kris Newby to fire home the loose ball just inside the box. The visitors doubled their lead inside ten minutes as Lewis Godbold broke down the left flank and slotted the ball in to Danny Emmanuel who turned his marker and shot in to the bottom right corner. Aveley got their first clear cut chance 25 minutes in as Nathan Koranteng burst down the left wing, Witham’s keeper came racing off his line and hesitated leaving the goal gapping but Koranteng delayed the shot and came to nothing. In the second half Kyle Asante had too glorious chances to get back into the game for the home side with a chested volley going narrowly wide and his overhead kick going just over ten minutes later. With three minutes of normal time remaining Newby went down softly in the box but the referee point to the spot leaving Aveley manager Justin Gardener furious. Witham Town’s captain stepped up and placed the penalty straight down the middle ending the game on a sour note but the visitors rightly deserved the three points. This entry was posted in Football, Sport and tagged Aveley, Danny Emmanuel, Justin Gardener, Kris Newby, Nathan Koranteng, Witham, Witham Town.